Part 1 of this post covered some advanced examples of -statplot-, focusing on the use of combinations of over() and by() options. In Part 2, I examine some strategies to use -statplot- with really long variable and/or value labels. 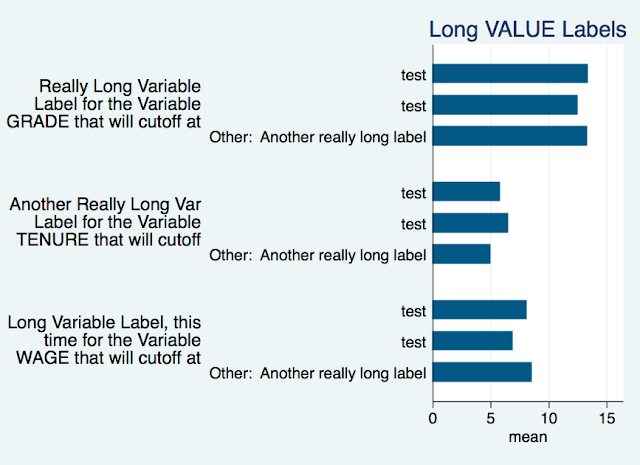 Recently, I was using -statplot- to create some tables in a paper where some of the labels in the tables needed to be the (longish) question and answer choice text, I discovered how long labels can really be a pain for graphs. This is a problem for any graph in Stata, regardless of whether your labels are in the legend or at the axis; however, my preference is that long labels (up to a limit) look better at the axis. So, the examples below show how to use -statplot- options to create wrapped labels. I hope to create an option to help make this a part of -statplot- at some point in the future, but for now, the code below is a good template for helping you to automate wrapping labels. 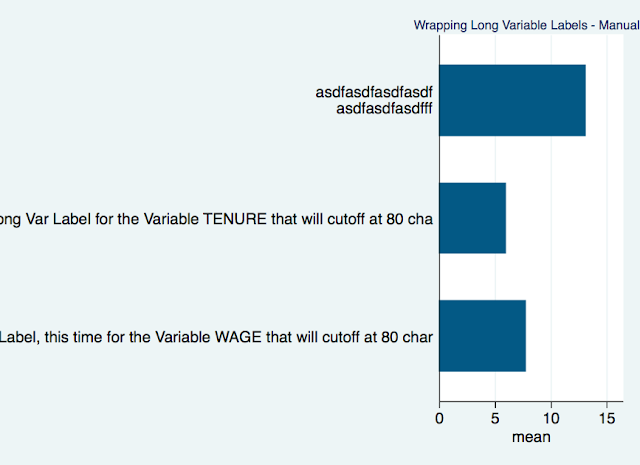 This can be extended to other plotting packages/commands. Continuing from the last post, we're using the in-built "nlsw88" dataset. Let's first look at plots with long variable labels first, and then we'll look at long value labels (which are a bit more complicated). Note: Please make sure you update your -statplot- to the latest version since an earlier version of the program bites when you have double quotes in suboptions, as I do in the examples below. Figure 9 (below) shows what happens when we have really long variable labels for grade, tenure, and wage. 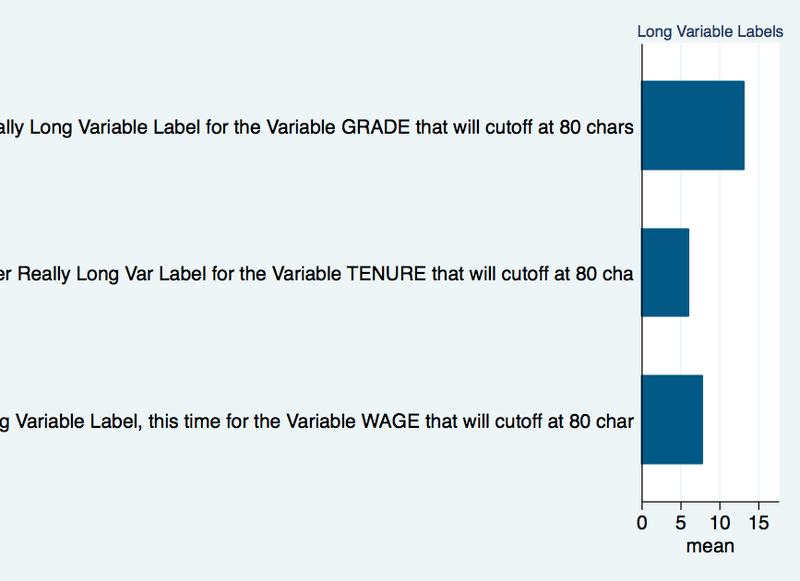 lab var grade "Really Long Variable Label for the Variable GRADE that will cutoff at 80 chars"
lab var tenure "Another Really Long Var Label for the Variable TENURE that will cutoff at 80 chars"
lab var wage "Long Variable Label, this time for the Variable WAGE that will cutoff at 80 chars"
This is better. However, it can be kind of a pain to manually relabel variables by counting up the number of characters and putting in the double quotes to wrap each label so that they each have roughly equal length. We could automate this process to (1) save time and (2) use an extended macro function (see -help extended_functions-) to create roughly equal labels without breaking in the middle of words. 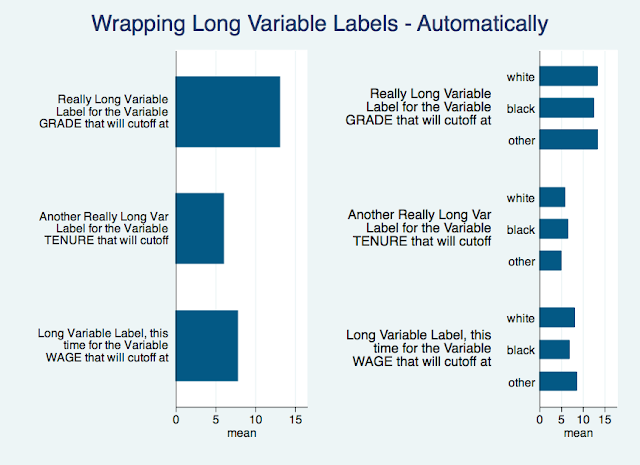 However, it's a lot more efficient (and fun) to create a code to automate the shortening of long value labels for us. The code below wraps long value labels, but it might be worth adding some code to also truncate ridiculously long value labels at some point. 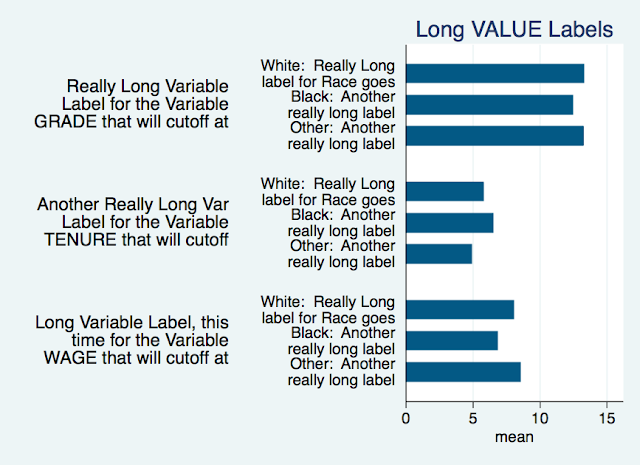 Notice that the loop that helps to automate the long value label wrapping is similar to the loop for wrapping variable labels, but it includes a portion that uses -levelsof- to detect the values of the over() variable. There's a lot packed into this graph --which sort of defeats the purpose of a graph -- but hopefully you won't need this much packed into the nested labels of your -statplot- graph. Note that you could also add bar gaps/spacing and smcl formatting to these labels to make them stand apart a bit more. Finally, you may not want your value and variable labels permanently wrapped, so you can put preserve/restore before and after these loops above to make these changes temporary. As always, watch for wrapping issues with the code snippets above. Click to download the do-file code for these figures.